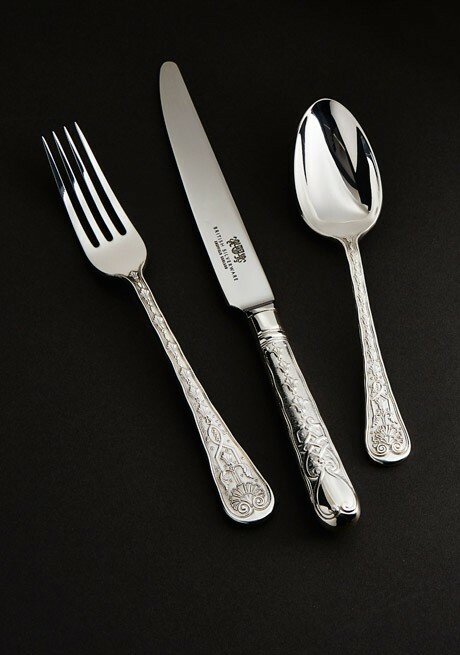 The British Silverware collection of Hand Forged patterns is unique in the world today. Only available in sterling silver the cutlery is primarily made by hand. It is superbly detailed with exquisite definition and meticulously hand-finished in Sheffield in a manner basically unchanged for generations. The sterling silver is uniquely crafted by artisans who deftly shape every piece one at a time. 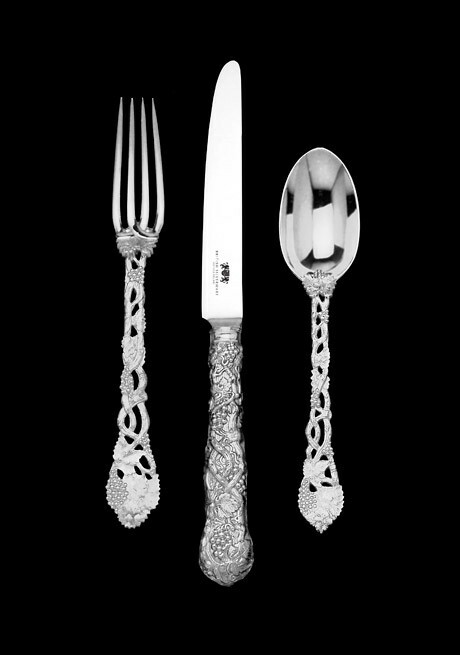 Silversmiths in the truest sense of the word combine finesse with restrained force and produce a product of unmatched elegance. The richly ornate pattern is from the design first produced by the Victorian Silversmith Francis Higgins for the Great Exhibition of 1851. Each piece is carefully pierced and chased to give the impression of interwoven vine leaves whilst retaining weight and strength. This elegant patter was first crafted in 1850, in what was known as the 'Romanesque' style. Its design motif incorporates shells and scrolls. The reverse is similar but with a plain inscription shield. This pattern is quintessentially English featuring the Rose. It is hand forged and to create such definition requires heavy silver sheet which is cut to size for each piece. The skill of the craftsman ensures balance and finesse as each piece is fashioned individually. This pattern has also been known as Bright Vine and was initially made a century ago. The dignified pattern has shell foliage at the top which is surrounded by beautifully modelled vine leaves and grapes.